In April 2008, as the global financial crisis was brewing, Angela Merkel hosted a 60th birthday reception in her Berlin chancellery for Deutsche Banks then-chief executive Josef Ackermann. Eight years later, her government is doing its best to keep Germanys biggest bank at arms length. Chastened by a series of government clashes with Deutsche Bank, the lenders financial woes are the last thing Merkel needs as she considers running for a fourth term. After a magazine article stirred speculation, Merkels spokesman moved swiftly to stem the notion that the lender might require state aid as the U.S. seeks a multibillion dollar fine, with negotiations opening at $14 billion. Its unimaginable that we would help Deutsche Bank with taxpayers money, Hans Michelbach, a senior lawmaker in Merkels Christian Democrat-led bloc, said in an interview. It would lead to a public outcry. The political establishment would lose credibility if the government jumped in. For Merkel, any whiff of government action would be electorally toxic just as she faces a backlash against her refugee policy, unrest in her party bloc and slumping poll ratings. She declined to comment Tuesday on whether Deutsche Banks woes warrant government help. The only thing I want to say is that Deutsche Bank is part of the German banking and financial sector and that of course we wish that all companies, also if theyre having temporary difficulties, can develop well, the chancellor said in reply to a reporters question in Berlin. Any rollback after years of cracking down on too-big-to-fail banks, pushing for a financial-transaction tax and putting the brakes on bank bonuses would be a near-impossible sell to a restless electorate. It would also clash with post-crisis European rules championed by Merkel and Finance Minister Wolfgang Schaeuble, which they sold to German voters as a way to avoid future taxpayer-funded bailouts. Anything that looks like giving money to the financial industry would be met with particular criticism in an election year, said Joerg Rocholl, head of the ESMT business school in Berlin. Any bailout would be viewed as an example of what people have criticized – that profits are privatized while losses are socialized, he said. Merkel honed her stance toward the financial industry during Europes debt crisis. While defending sovereign bailouts as necessary for keeping the euro area together, she portrayed the crisis as a battle for dominance between investors — she called them the so-called markets — and politicians responsible to their publics. 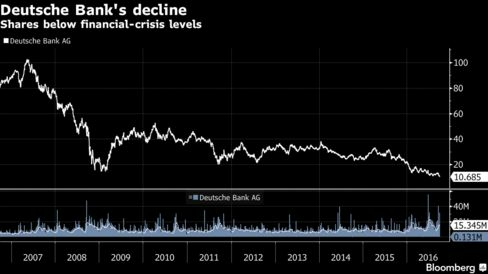 Deutsche Bank touched a record low for the second consecutive day, declining 2.8 percent to 10.24 euros at 12:48 p.m. in Frankfurt. Merkel has political wounds from previous rounds of sparring with Deutsche Bank. She came under a hail of criticism after hosting Ackermann for his birthday party. Later that year her government slammed Ackermann for telling Spiegel Online that he would be ashamed to take government money. Three years later, they clashed at the World Economic Forum in Davos over how to manage the sovereign-debt crisis. Merkel has been keeping her distance since. After the bank appointed John Cryan to replace co-CEOs Anshu Jain and Juergen Fitschen in June 2015, Merkel demurred when asked whether the changes could help restore the lenders ailing finances. It had no surprise effect on me, Merkel told reporters while attending a Group of Seven summit in Bavaria. I want Deutsche Bank to be able to work successfully. It makes its own decisions, like any company in Germany. Deutsche Bank said on Monday its determined to meet the challenges on its own. Yet Merkel may come under pressure to intervene as the U.S. Justice Department negotiates with the lender over the fine. The International Monetary Fund said in June that Deutsche Banks links to other lenders may make it the single biggest contributor to systemic risk among global banks. While Merkels most ferocious critics heckled her on aid to Greece, she ultimately did whatever it took to guarantee stability and keep the euro intact. The same reasoning might apply when it comes to the survival of a bank whose roots go back to the founding of the German state. I dont buy at all whats coming out of Germany in terms of Germany not wanting to step in ultimately if Deutsche Bank was really in trouble — its too important for the German economy, Andreas Utermann, chief investment officer at Allianz Global Investors, told Bloomberg Television. Almost half of the banks 101,000 employees are based in Germany, as are 56 percent of its shareholders, according to Deutsche Banks last annual report. The majority of the banks 189 billion euros of consumer credit exposure at the end of 2015 was in Germany. We need an internationally operating bank thats a partner for internationally operating companies, Michael Fuchs, a lawmaker for Merkels Christian Democratic Union, said by phone. European Union law put in place after the financial crisis puts up high barriers for governments to give financial support to viable banks — something thats hampering Prime Minister Matteo Renzi in seeking any direct rescue for Italian banks. A workaround for governments to help solvent banks is largely limited to addressing a capital shortfall identified in a stress test or asset-quality review. Deutsche Banks deteriorating capital and mounting legal costs are already making it a topic for politicians in Berlin. Social Democratic lawmakers discussed the banks woes at a closed-door meeting last week, according to two people who knew of the event. 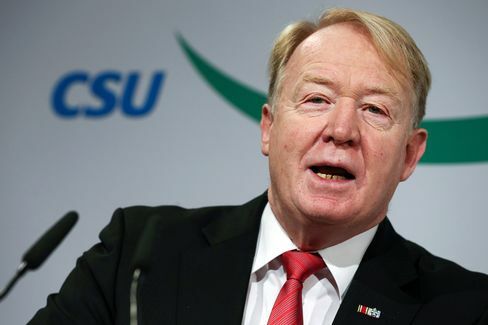 Merkels chief spokesman declined to confirm a specific meeting between Merkel and Cryan as suggested in the report by Germanys Focus magazine, saying only that there was no one-on-one meeting in the last three months and that she meets with bank executives regularly. As far as the chancellor is concerned, there was no such meeting, Seibert said. It could come about but I dont know that there was a larger group that may have included the chief of Deutsche Bank.